The Thirtymile fire, started by an escaped campfire near Winthrop, Washington, claimed the lives of four U.S. Forest Service firefighters July 10, 2001. On January 30, 2007 the U.S. Attorney in Spokane, Washington, charged the Incident Commander of the fire with four counts of involuntary manslaughter and seven counts of making false statements. The International Association of Wildland Fire (IAWF), a non-profit, professional association representing members of the global wildland fire community, initiated a survey of wildland firefighters after hearing speculation that some firefighters were no longer going to serve in certain key management positions on wildland fires due to the new threat of going to prison for making mistakes on fires. The objective was to collect data to determine the scope of the issue, and provide objective information to the wildland fire agencies. Wildland firefighters were invited by e-mail and postings on wildland fire forums to take the survey, which could only be taken once from each computer. The survey was taken by 3,362 people. The IAWF hopes that the data it collected about the effects of the criminal charges will assist wildland fire agencies and policy makers to formulate a strategy for mitigating the adverse impacts that the survey identified. The complete survey results can be found on the IAWF web site at http://www.iawfonline.org/documents.shtml in the News Releases section. Feb. 28--An early morning fishing trip for a 55-year-old woman and her pit bull turned into a rescue mission for West Sacramento police and firefighters. "She was floating down the river on a piece of dock that had broken off and was yelling for help," said fire Division Chief David Sherlock. "She said she was fishing, but I didn't see any fishing pole. There are some things you just don't ask," Sherlock said. West Sacramento dispatchers received a call shortly after 5 a.m. from a worker who heard a woman yelling for help in the river near South River Road and Linden Road. Firefighters dispatched one of their boats into the water and found the woman floating on a piece of wooden dock about 15 feet by 20 feet. The woman, whose name was not released, was wearing a life vest, was dressed in layered clothing and had a green light she used to flash at the rescue boat. Firefighters found the woman wet and shivering. She told them she was fishing on a dock with her dog when the dock broke into two and she found herself in the water. She was able to get herself on top of the broken piece of dock, and was floating down river yelling for help. After she was plucked from the water, she was taken to the Sacramento Yacht Club on South River Road, and from there was transported to UC Medical Center. She was expected to be treated and released. Feb. 18--On the third day of a controlled burn in Nevada County, flames devoured the dry underbrush with an ease that both satisfied and unsettled Battalion Chief Rob Paulus. Manzanita bushes burst into 60-foot flames as fire whirled through Malakoff Diggins State Historic Park: a good sign that dead fuels were being eliminated as intended, a bad omen of the destruction a wildfire in these lands would leave in its wake. "If I was a betting man," Paulus says, "I'd bet on a dry spring, early fire season." Even with February rains breaking the January dry spell, this winter's bone-dry record has Paulus and his colleagues in the California Department of Forestry and Fire Protection concerned about the 2007 fire season. Coming on the heels of 2006 -- a terrible year in terms of acres burned by California wildfires -- some in the fire service worry that unforgiving weather conditions and long-term factors such as brush buildup could portend worse for 2007. "If we don't get the rain, 2006 is going to look like a walk in the park," said Paulus, a battalion chief in the Nevada-Yuba-Placer Unit of CAL FIRE, the abbreviation now replacing CDF. The two agencies primarily responsible for fighting wildfires in California -- CAL FIRE and the U.S. Forest Service -- reported an upsurge in acreage burned in 2006. In the 23.5 million acres for which CAL FIRE is directly responsible, 5,963 fires burned 221,607 acres, far surpassing 2005 and the five-year average. Last year's acreage was overshadowed only by 2003, an infamous year that saw more than 404,000 acres burned, according to CAL FIRE. In the 20 million acres of U.S. Forest Service park land in California, 1,888 fires charred 453,500 acres in 2006. That's the third-highest acreage burned in a year over the last 20, said spokesman Matt Mathes. Officials say various factors led to such destruction, the first being weather. Rains came early and heavy, followed by a premature spring and the growth of a lush forest understory that dried out quickly. A sizzling summer almost unbearable for humans proved particularly hospitable to fire. But long-term factors contributed as well, such as dense tree stands and overgrowth of low-to-the-ground fire fuels -- product of a decades-long philosophy of fire suppression, officials said. A public backlash against years of logging in California began in the 1970s. In championing preservation, taxpayers, legislators and fire officials campaigned not only against wildfires but any kind of surrogate, such as the thinning of forests, Mathes said. They were successful -- in stomping out fire and throwing the forests out of whack. "Smokey the Bear did too good a job," Mathes said. "In retrospect, we're seeing (fire officials at the time) were well-intentioned, but probably too overzealous in greatly reducing the role of fire in an ecosystem that desperately wants to burn -- and needs to burn to restore itself." The overgrowth on the forest floor has had two significant consequences when fire strikes, officials said. First, flames spread rapidly, charging through dense vegetation. Second, the underbrush creates what firefighters call a "ladder," allowing fire to climb from the ground to treetops. Such "crown fires" nearly always prove fatal to trees that might otherwise go unscathed. Such conditions can quickly create unmanageable fires. "We are able to stop 98 percent of fires at 300 acres or less," Mathes said of the Forest Service. "What we're seeing is that more and more, the fires that get big get really big and defy control." That worries not only firefighters, but environmentalists like state parks forester Rich Adams. Though respectful of fire's importance in nature, he recognizes that a wildfire in Malakoff Diggins or his surrounding Sierra District -- where fire has been absent for decades -- would not be restorative, but crippling. "Fires are burning 5,000 acres in five hours," Adams said. "We could lose our whole park in a day." Meanwhile, more and more Californians have been leaving urban centers for the "wildland-urban interface," CAL FIRE-protected lands where cities meet rural landscapes. As a result, officials have seen an exponential rise in the devastation left by wildfires, said Chris Dicus, a forestry and wildfire expert at California Polytechnic University, San Luis Obispo. "Fire sees vegetation as fuel," he said. "It also sees million-dollar homes as fuel." Not only has that human migration put structures and lives in the path of fire, officials say, it also has increased the risk of fire. About two-thirds of blazes fought by CAL FIRE in 2006 were caused by humans or their devices. With the ignition source drawing closer to the fuels, more fires are burning. "It's definitely a cause-and-effect," said CAL FIRE spokesman Daniel Berlant. All these factors, combined with a dry winter , have many in the fire service concerned that the worst is yet to come. January set a record for lack of rainfall in the Sacramento area. And only 7.29 inches of rain have fallen since July 1; 13.35 inches is normal. The drought has been mirrored elsewhere, with dryness prompting early fires. As of Feb. 11, 1,653 acres had burned in CAL FIRE-protected lands statewide, compared with 94 in the same period last year and a five-year average of 1,540. Fire officials note that weather is unpredictable, and it is too early to predict what kind of fire season California will suffer. But firefighters like Paulus are nonetheless heeding the early warning signs. They are increasing the amount of controlled burning, and stressing to residents the importance of protecting their homes. "People are going to move from the Bay Area to Auburn because it's beautiful. But we do have to educate them," Berlant said. "This is fire territory, and you have to live with fire." Because in California -- a state synonymous with wildfires -- "it's not a matter of if," Paulus says, "but when." A landslide sent rocks and boulders tumbling down onto an apartment building early Tuesday, sending 150 residents of San Francisco's North Beach district into the streets. No injuries were reported, but city engineers were assessing the safety of the remaining hillside as well as possible damage from the massive pile of boulders and mud lodged against an apartment building and a night club at the bottom of the hill, Fire Department Lt. Ken Smith said. The hillside collapsed a little after 3 a.m., closing a main thoroughfare through the city. A 45-unit apartment building at the top of the hill also was evacuated. Authorities were still trying to determine what caused the slide." SOUTH PASADENA, Calif. - The city's firefighters have reluctantly agreed to a new contract after more than a year and a half of impasse. The South Pasadena Fire Department and City Hall have been struggling to negotiate a new contract after the last one expired in 2005. Under the deal, firefighters would receive a one-year, 2.25 percent raise. The contract, which will be retroactive to 2006, will run out in June. Union members said they were unhappy with the outcome, but decided to settle anyway. "Basically, we needed to put some money in our guys' pockets," said fire Capt. Kris Saxon, who is also president of the South Pasadena Firefighters Association. The city has a single firehouse with about 22 employees. Tension increased in 2005 after the city decided not to contract services out to neighboring Pasadena or Los Angeles, a move that would have boosted firefighter salaries. Last year, union president Brett Hill resigned after two decades in the department, saying he was frustrated over pay issues. City manager Lillian Meyers said the city was aware of wage inequities. "Our goal is to establish equity along city positions," she said. "We know that many of our salaries are likely out of whack, or at least below the median." Car Fire Sparks 5,000 Acre Brush Fire in California - Firehouse.com Personal Protective Equipment: "Kern County fire crews said a car fire near Lower Water Hole in the Grapevine has sparked a brush fire that has now spread to almost 5,000 acres. The fire is now 50-percent contained and Kern County fire says they hope to have it fully contained by 6pm Saturday. 375 firefighters from Kern County, LA County, California Department of Forestry and the National Forest Service are on the fire lines, and they expect 700 firefighters to be working the fire by Saturday morning. The fire is burning on Tejon Ranch property west of Interstate-5. One problem crews encountered Friday was high-voltage power lines near the Tecuya Canyon, where thick smoke caused the lines to ground, putting firefighters in potential danger. No one has been injured, no evacuations have been ordered and no homes or structures have been threatened." Wildfires Claimed 24 Firefighters in 2006 - Firehouse.com In The Line Of Duty: "
Two dozen firefighters died last year battling wildfires across the United States, a number that has increased in the face of drier summers and increased job pressures. The 2006 death toll is not an all-time high, but is part of a rising trend - double the number in 2005, and six more than the average of the past 10 years. The 10-year average has been rising, too, from 6.6 in the 1930s to 18 in the 2000s, according to U.S. Forest Service statistics. Experts warn that the size and intensity of wildfires is increasing due to longer, hotter and drier summers and a buildup of fuel"
FREMONT -- Is there a doctor in the house? Fremont Fire Department officials are asking that question as part of their preparation for dealing with a local emergency in the future. To that end, the city's disaster preparedness leaders have begun recruiting retired or active doctors, nurses and other medical professionals to join the Fremont Medical Reserve Corps. They hope to add as many as 400 medical volunteers to the group, said Vic Valdes, retired Fremont Fire Department deputy chief. As coordinator of the Fremont Metropolitan Medical Response System, Valdes would lead the city's response to a natural disaster or a terrorist attack. "We think of the improbable and start planning for it," said Valdes, a firefighter for 30 years before retiring in September. Likewise, the Medical Reserve Corps will be asked to respond to the Tri-City area's health needs in case of a local emergency. Valdes' job is to make sure their work in providing "mass medical care" is coordinated with other public safety agencies and volunteer teams. For instance, the Fremont Citizen Corps, a group of local volunteers, already has participated in two test response exercises related to dispensing mass medication. The Fremont Medical Reserve Corps is the local branch of a national program started in 2002 as part of the federal Homeland Security Department. Non-medical volunteers, such as bilingual speakers, also are urged to join the Corps. With nearly 140 languages spoken in Fremont alone, "people whospeak other languages are extremely important during a crisis because you need to do quick screenings of people's medical histories as you do a mass distribution of medicines and treatments," Valdes said. Corps volunteers also would be asked to improve the community's day-to-day health issues, including youth obesity and the disparities in the quality of medical treatment among low-income families. Those efforts improve the lives of residents before and during an emergency, Valdes said. "Disaster preparedness is not something you do once and put on a shelf," he said. "It's a daily thing." For more information on the Fremont Medical Reserve Corps, call (510) 494-4244. Alvarado Street stays closed after fire guts building. destroyed a 101-year building that housed 21 businesses. Monterey city officials are scrambling to allow the reopening of as many Alvarado Street businesses as possible after a late-night fire destroyed a 101-year building that housed 21 businesses. City officials said they hoped to get power restored to lower Alvarado Street, north of the 400 block most impacted by the 10:15 p.m. fire, as soon as possible. PG&E crews were working on damaged equipment in the middle of the street at 9:30 a.m. as firefighters continued to pour water on the burned-out building to quell hot spots. City Manager Fred Muerer said businesses in the 400 block wouldn't be allowed to reopen until the burned building is braced and a protective wall is built to prevent its scorched walls from collapsing into the street. City officials also are working on plans to re-route traffic around the block and to ensure that pumps that carry storm water from downtown don't become clogged with fire debris. They also urged residents not to go near the fire area just too watch. "We have many more important things to do than hustle lookers away," Bill Reichmuth, the city's public works supervisor. Fire officials said one firefighter was treated for a cut to his hand while fighting the blaze. Among the businesses destroyed on the 400 block of Alvarado were the downtown Starbucks and a Quizno's restaurant. Other businesses damaged were Goomba's, Kaiya boutique, Futons and Such, as well as upstairs service businesses that include an income tax preparer, an environmental consulting business and a computer repair shop. Curtis Gandy, who is the executive director of the Fort Ord Toxic's Project, said he was upstairs in his office when he heard the commotion on the first floor. Gandy, whose business has been in the location for about five years, quickly grabbed cash receipts and his shoes. Computer equipment along with legal documents were left behind. He said he handed keys to the building to responding firefighter's as he fled the building. "I saw the smoke rolling out," said Gandy, who watched the blaze across the street with other onlookers early Thursday. Officials said the fire started either on the first floor or the basement nearest Quizno's and smoke moved quickly through the other stores. Firefighters from Monterey, Pacific Grove, Marina, Salinas, Spreckels, Carmel Valley, Monterey Peninsula Airport and Seaside worked to contain the blaze. 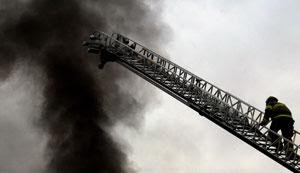 Two ladder trucks were placed at the scene as firefighters doused the two-story building with water. (BOB)San Francisco- A police dog searching a police facility in San Francisco's Hunters point area has found highly unstable WWII vintage explosive dynamite. Authorities may have to detonate it on the spot. The crystallized dynamite was found by a police dog in a locker that belonged to a Police officer that died last year. found old explosives left over from when the Navy occupied the building!